Hard Evidence: How biased is the BBC? Does the BBC really have a left-wing, anti-business agenda as certain elements of the press like to claim? Or is there more to it than that? Cardiff University Lecturer Mike Berry crunches the numbers to see where Auntie's leanings really lie. This article was originally published on The Conversation, where it forms part of Hard Evidence, a series of articles that looks at what the data say about some of the trickiest public policy questions we face. Academic experts will delve into the available research evidence to provide an informed analysis of current affairs you won’t get from politicians or vested interests. Here, Cardiff University Lecturer Mike Berry uses his research to tackle a question as old as broadcasting itself: is the BBC really impartial? If you are a reader of the right end of the British press you will be familiar with stories claiming that the Corporation has a liberal, left-wing bias. Only last week the Daily Telegraph reported a new study had found that the BBC “exhibits a left-of-centre bias in both the amount of coverage it gives to different opinions and the way in which these voices are represented”. Other critics have accused the BBC of having a pro-EU and anti-business slant. But how true are these accusations and what does the evidence suggest about the range of views the corporation features in its news output? Along with a group of colleagues at Cardiff University, I recently completed a major content analysis of BBC coverage. This research was funded by the BBC Trust as part of an ongoing series of studies examining the impartiality of its reporting in areas such as regional news, the Israel-Palestine conflict, the Arab Spring, business and science. Our research had two strands. One examined the range of topics and sources featured in BBC broadcast news and how that compared to what was provided by other broadcasters. A second strand looked in detail at the BBC’s online and broadcast reporting of immigration, the EU and religion. We analysed news coverage from both 2007 and 2012 in order to identify any possible changes over time. One of the most striking findings was the dominance of party political sources. In coverage of immigration, the EU and religion, these accounted for 49.4% of all source appearances in 2007 and 54.8% in 2012. In reporting of the EU the dominance was even more pronounced with party political sources accounting for 65% of source appearances in 2007 and 79.2% in 2012. 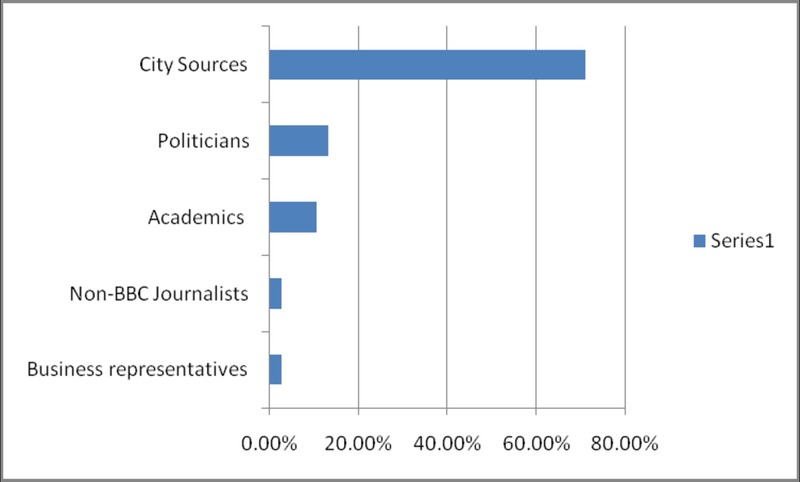 Political sources were also much more likely than other sources to be featured in the opening sections of news reports which had the consequence of reports being framed from party political perspectives which other sources then had to respond to. Among political sources, Labour and Conservatives dominate coverage accounting for 86% of source appearances in 2007 and 79.7% in 2012. Our data also show that Conservatives get more airtime than Labour. Bearing in mind that incumbents always receive more coverage than opposition politicians, the ratio was much more pronounced when the Conservatives were in power in 2012. In strand one (reporting of immigration, the EU and religion), Gordon Brown outnumbered David Cameron in appearances by a ratio of less than two to one (47 vs 26) in 2007. In 2012 David Cameron outnumbered Ed Milliband by a factor of nearly four to one (53 vs 15). Labour cabinet members and ministers outnumbered Conservative shadow cabinet and ministers by approximately two to one (90 vs 46) in 2007; in 2012, Conservative cabinet members and ministers outnumbered their Labour counterparts by more than four to one (67 to 15). In strand two (reporting of all topics) Conservative politicians were featured more than 50% more often than Labour ones (24 vs 15) across the two time periods on the BBC News at Six. So the evidence is clear that BBC does not lean to the left it actually provides more space for Conservative voices. So what about the accusation that the BBC is pro-EU? Again the evidence points in the opposite direction. In each sample period, a single story was dominant in broadcast coverage. In 2007 it was the Lisbon Treaty, which accounted for 70% of coverage and in 2012 it was negotiations over ratifying the EU budget which accounted for 72% of coverage. In both cases the debate was dominated by the representatives of the two main parties and the EU was framed narrowly as a threat to British interests. In 2007 debate revolved around three points argued by Conservative Eurosceptics: that Britain hadn’t secured her “redlines” on maintaining British sovereignty; that the treaty was a repackaged version of the EU constitution; and that a referendum was necessary to ratify it. Labour contested these arguments. In 2012 the budget debate pitted the Conservative leadership (for the budget settlement) against the Eurosceptic wing of the Conservative party and Labour who opposed it. There are two points to be made about this coverage. First, it saw Europe almost exclusively through the prism of political infighting between Labour and the Conservatives so a rounded debate about the multiplicity of ways the relationship between the EU and UK affects Britain was almost completely absent. Second, although UKIP received very little airtime, Euroscepticism was very well represented through Conservative politicians. Voices arguing for the benefits of EU membership were very sparse. This was a consequence of Labour politicians being unwilling to make the positive case for Europe because of its perceived unpopularity amongst voters. This meant that business lobbyists provided much of what little pro-EU opinion was available. What about the accusation that the BBC is anti-business? Once again the evidence shows that the opposite is the case. In both 2007 and 2012, across all programming, business representatives received substantially more airtime on BBC network news (7.5% and 11.1% of source appearances) than they did on either ITV (5.9% and 3.8%) or Channel 4 News (2.4% and 2.2%). When we compare the representation of business with that of organised labour, the findings are even more striking. On BBC News at Six, business representatives outnumbered trade union spokespersons by more than five to one (11 vs 2) in 2007 and by 19 to one in 2012. On the issues of immigration and the EU in 2012, out of 806 source appearances, not one was allocated to a representative of organised labour. Considering the impact of the issues on the UK workforce, and the fact that trade unions represent the largest mass democratic organisations in civil society, such invisibility raises troubling questions for a public service broadcaster committed to impartial and balanced coverage. The robustness of these findings is reinforced in research on how the BBC’s Today programme reported the banking crisis in 2008. 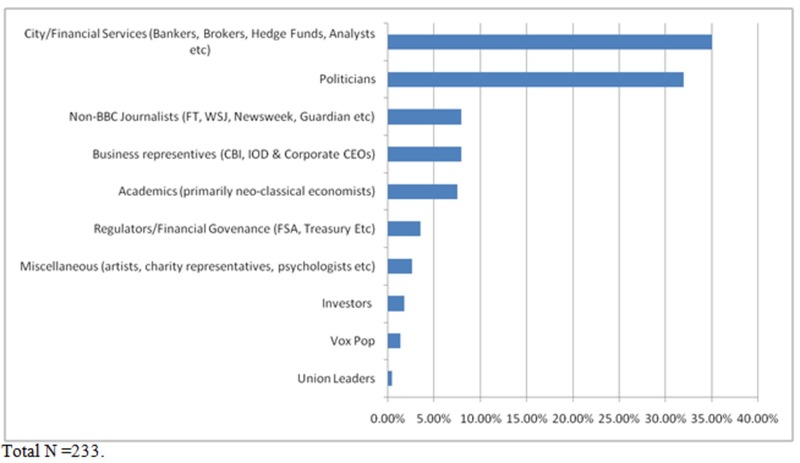 The table below shows the sources featured during the intense six weeks of coverage following the collapse of Lehman Brothers. Today programme banking crisis interviewees 15/9/2008 to 20/10/2008. The range of debate was even narrower if we examine who the programme featured as interviewees in the two week period around the UK bank bailouts. This can be seen in the next table. Today programme banking crisis interviewees 6/10/2008 to 20/10/2008. Here opinion was almost completely dominated by stockbrokers, investment bankers, hedge fund managers and other City voices. Civil society voices or commentators who questioned the benefits of having such a large finance sector were almost completely absent from coverage. The fact that the City financiers who had caused the crisis were given almost monopoly status to frame debate again demonstrates the prominence of pro-business perspectives. So the evidence from the research is clear. The BBC tends to reproduce a Conservative, Eurosceptic, pro-business version of the world, not a left-wing, anti-business agenda. The funding for some of the research discussed in this article was provided directly by the BBC Trust. Dr Mike Berry is a Lecturer at Cardiff University School of Journalism, Media and Cultural Studies.